Plenty of mate-for-life animals have become symbols of commitment, love, and fidelity for humankind. Among others, the monogamist club includes elegant swans, hand-holding beavers, and hopelessly romantic Malagasy giant rats. But how do they make it work? For southern rockhopper penguins, the tough, yearly cycle of courting, mating, and chick-rearing requires lots of teamwork—but only a month or so, according to a new collaborative study. Then it’s off to an extended winter’s worth of “me time,” possibly spent hundreds or thousands of kilometers apart. The entire process takes about 70 days and overall, the pair spends only about 23 percent of the annual cycle together. 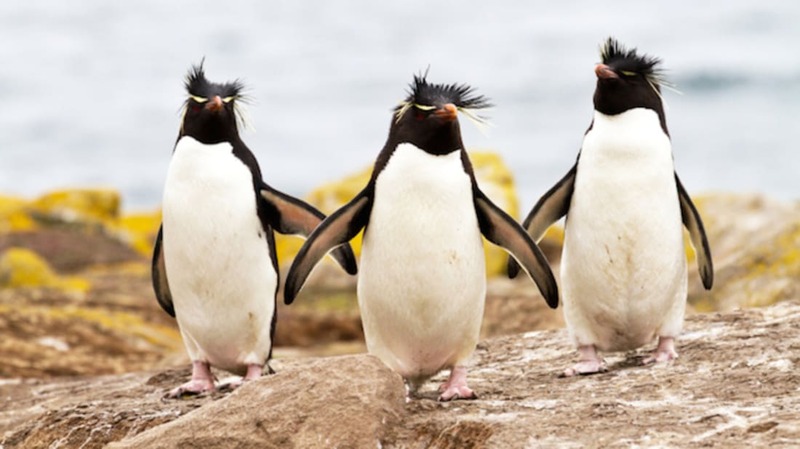 The study also noted that female southern rockhopper penguins tended to leave the mating ground about six days earlier than their male partners and also return six days later. Once both members of a pair left the area, their fishing and foraging habits throughout the winter put an average of 600 kilometers between them. One couple even achieved a special level of long-distance partnership when a female’s winter journey took her approximately 2500 kilometers from her mate (and clear over to the Argentine Basin).